1955 found Elvis Presley very busy because of his new management deal with Bob Neal, playing three shows in West Texas area. San Angelo, Lubbock and Midland, just prior headdin' to a new performance at The Louisiana Hayride. 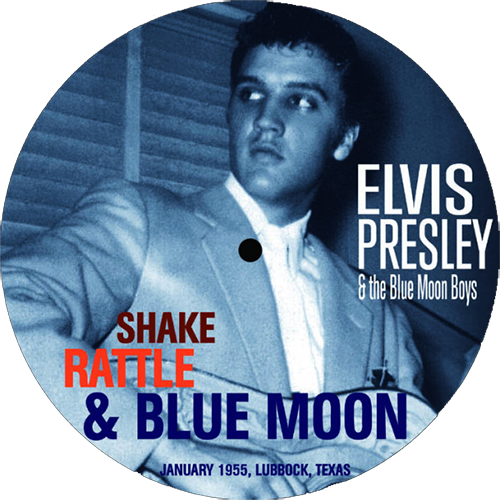 It was in Lubbock where Elvis and the boys were invited by DJ Dave Stone of KDAV to promote their show. Elvis, Scotty and Bill agreed and played live two songs, Big Joe Turner’s big hit 'Shake, Rattle & Roll', which Elvis would record for RCA one year later, and 'Fool, Fool, Fool' from The Clovers, a song that Elvis would never try on record. Both songs were recorded on acetate by Dave Stone, and now you can find them on this deluxe 7 inch single. Later that evening two young amateurish singers named Buddy Holly and Waylon Jennings attended to Elvis show and met him backstage. And their music changed forever.